Percent is one of the most commonly tested topics on the GRE. At times, it is a direct question such as the following. 1. If there are 800 employees working in a cycle factory and 25% employees were absent on a certain day, then how many employees were absent on that day? At times, it is a complex word problem involving percents. 2. John sold 27 pieces of Beat-O-Bo at $200 apiece at a profit of 20% above his purchase price. He sold remaining 3 pieces of Beat-O-Bo to a scrap dealer at 50% of the purchase price. What was John’s overall profit percent for the 30 pieces of Beat-O-Bo? At times, you will find word problems asking for percent increase or percent decrease. 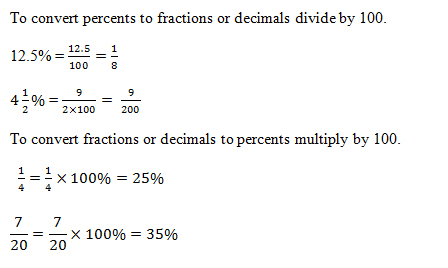 However, percent questions are all about basics! By the way, GRE doesn’t use the term percentage. In India, however, we mostly use the term percentage. So be it! It’s elementary, my dear Watson, quite elementary! Let’s start by understanding what ‘Percent’ actually means. ‘Per’ means ‘out of’ and ‘cent’ means ‘100’. So, percent means ‘out of 100’. Basically, it is a way to express relationship, where ‘whole’ is 100. Thus, 45% equals or 0.45. 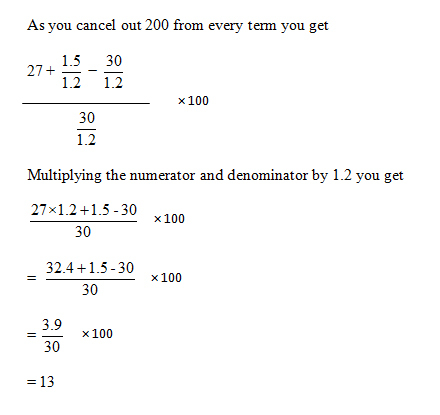 Percents can thus be expressed in the form of fractions as well as decimals. 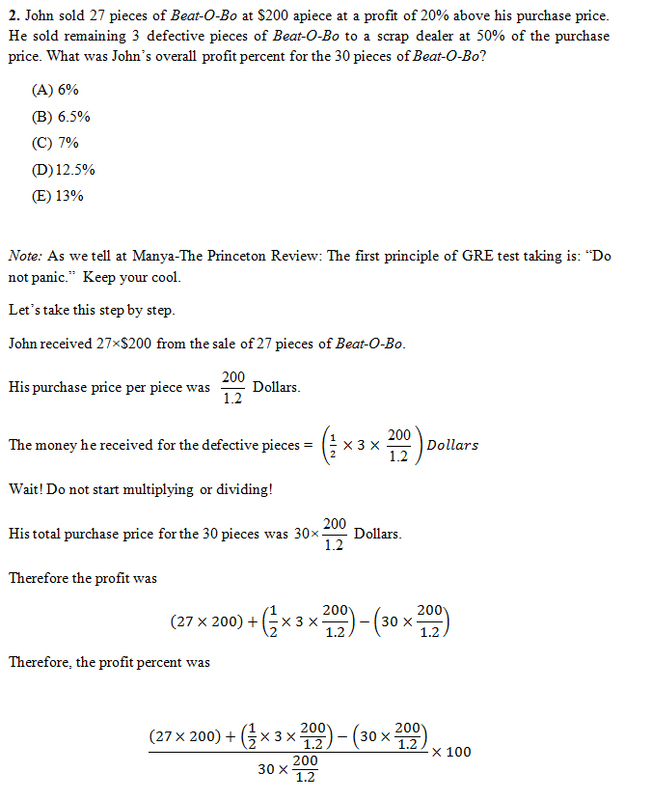 You will find a good number of questions involving percents on the GRE. At Manya-The Princeton Review, we recommend that you just translate English into Math. Let’s start with the basic question we mentioned in the beginning. Note: Essentially we want to find out — what 25% of 800 is. ‘%’ means ‘over 100’, ‘of’ means ‘multiplication’. Hence, the answer is 200. We will look at the more complex Q. No. 2 later; before that let’s try a few easier questions. Try to solve the following questions yourself, and then look at the notes that follow. 4. What is 40% of 20% of 800? 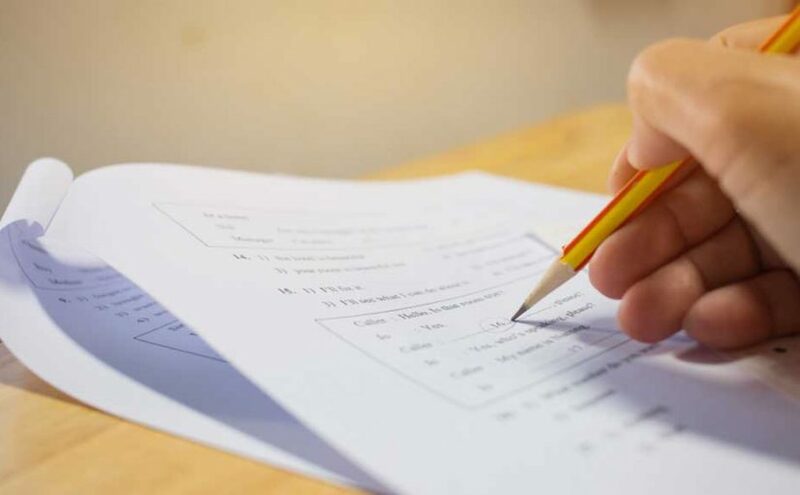 The questions on percent increase or decrease are the other types of percent questions which are frequently asked on the GRE, especially in the Chart questions. Let’s see how to deal with them. At Manya-The Princeton Review we go by the following principle. If the problem asks for a percent increase or what percent more, or what percent greater, then the original number is the smaller number out of the two. If the problem asks for a percent decrease or what percent less or what percent smaller, then the original number is the larger number out of the two. 5. John’s video game collection contains 600 games. Samantha’s video game collection contains 500 games. Samantha’s video game collection is what percent smaller than John’s? Ignore the percent sign and round off your answer to the nearest tenths place. 6. A radio that sells for $200 is on sale for $160. Sherlock purchased the radio at the normal price, and Michael purchased the radio during the sale. By what percent was the price that Sherlock paid more than the price paid by Michael? Percentage change= Difference/original x 100 . Here, difference is clearly $40. Now, picking up the right number for original is the challenge. Most of us may be quick to pick $200. But, take a moment and recall that we learnt that if the question is asking for “what percent more”, then the original number is the smaller number out of the two. Assuming that the original number is always the first number appearing in the question is a big folly. Don’t fall into the trap. Let the phrases “percent increase/more/greater” and “percent decrease/less/smaller” help you decide what the original number is. Hence, the answer is 25%. Fill only 25 in the numeric entry box. Typing 0.25 will be incorrect and will not yield any credit. Before we end this Part I of our discussion about percent questions on the GRE, let’s revisit the Q. No. 2. How we were able to solve this question doing very little calculation! While doing percent calculations, being number savvy helps! In Part II of this article, we will see how being number savvy leads us to some very useful percent tricks on the GRE.